You'll find a number of notable differences between SQL Examiner and other schema comparison tools. On the downside, your comparison sources cannot include backup files, only live databases, snapshots and creation scripts. However, SQL Examiner provides a number of extras you won't find elsewhere, including support for SQL Server versions 7.0 through 2012 (including SQL Database) and for cross-platform operations with Oracle and MySQL databases, although you're limited to the most basic database objects. 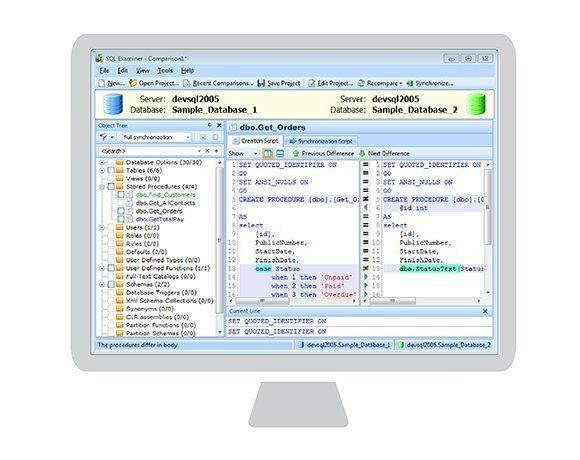 SQL Examiner also supports most objects when comparing and synchronizing SQL Server databases, such as assemblies, stored procedures, triggers, user-defined types and user-defined functions. In addition, you can compare and synchronize different SQL Server database versions and generate HTML and plain text reports, including those rendered in XML. SQL Examiner comes in two editions. Standard starts at $200 and Professional at $300. With Professional, you can rename columns, use creation scripts as a comparison source and integrate with one of the supported source control systems, including TFS, SourceSafe, SVN and Perforce. You also have available a command-line utility for comparison and synchronization operations. The utility can perform all the same tasks as the graphical interface and lets you automate database deployment and schema version management in source control.